The class method to be executed by the process created by JOB. The className cannot be $SYSTEM; it can be %SYSTEM. If you specify .. in place of className, JOB uses the current class context (the $THIS class). A comma-separated list of args arguments is optional; the enclosing parentheses are required. Omitted arguments are not permitted. For further details on using $CLASSMETHOD, refer to the section Dynamically Accessing Objects in the Object-specific ObjectScript Features chapter of Using Caché Objects. timeout Optional  The number of seconds to wait for the jobbed process to start. Fractional seconds are truncated to the integer portion. The preceding colon is required. The timeout argument can only be specified for local jobs. If omitted, Caché waits indefinitely. When a job begins, Caché can call a user-written JOB^%ZSTART routine. When a job ends, Caché can call a user-written JOB^%ZSTOP routine. These entry points can be used for maintaining a log of job activity and troubleshooting problems encountered. For further details, see the section on Using the Caché ^%ZSTART and ^%ZSTOP Routines in Caché Specialized System Tools and Utilities. An optional postconditional expression. Caché executes JOB if the postconditional expression is true (evaluates to a nonzero numeric value). Caché does not execute the command if the postconditional expression is false (evaluates to zero). For further details, refer to Command Postconditional Expressions in Using Caché ObjectScript. ^routine Specifies a routine that resides on disk. Caché loads the routine from disk and starts execution at the first line of executable code within the routine. label^routine Specifies a line label within the named routine, which resides on disk. Caché loads the routine from disk and starts execution at the indicated label. Specifies an offset of a specified number of lines from the line label. Use of offsets can cause problems with program maintenance, and is discouraged. You cannot specify an offset when calling a CACHESYS % routine. If you attempt to do so, Caché issues a <NOLINE> error. If you specify a nonexistent label, Caché issues a <NOLINE> error. If you specify a nonexistent routine, Caché issues a <NOROUTINE> error. For further details on these errors, refer to the $ZERROR special variable. A comma-separated list of values, expressions, or existing local variable names. The enclosing parentheses are required. This list is known as the actual parameter list. The routine must have a formal parameter list with the same or a greater number of parameters. If you specify extra actual parameters, Caché issues a <PARAMETER> error. Note that if the invoked routine contains a formal parameter list, you must specify the enclosing parentheses, even if you do not pass any parameters. You cannot omit items from the list of routine-params. When the routine starts, Caché evaluates any expressions and maps the value of each parameter in the actual list, by position, to the corresponding variable in the formal list. If there are more variables in the formal list than there are parameters in the actual list, Caché leaves the extra variables undefined. The number of seconds to wait for the jobbed process to start before timing out and aborting the job. The preceding colon is required. You must specify timeout as an integer value or expression. If a jobbed process times out, Caché aborts the process and sets the $TEST special variable to 0 (FALSE). Execution then proceeds to the next command in the calling routine; no error message is issued. If a jobbed process succeeds, Caché sets $TEST to 1 (TRUE). Note that $TEST can also be set by the user, or by a LOCK, OPEN, or READ timeout. The following example starts the monitor routine in the background. If the process does not start in 20 seconds, Caché sets $TEST to FALSE (0). This following example passes the routine parameters VAL1 and the string "DR." to the routine ^PROG, starting at entry point ABC, in the current namespace. The routine expects two arguments. Caché does not pass the current symbol table to this job, it will use a JOB Server if possible, and use tta5: as principal input and output device. For further details, refer to Object-specific ObjectScript Features in Using Caché Objects. After you start a jobbed process, Caché allocates a separate memory partition for it and assigns it a unique job number (also referred to as a Process ID or PID). The job number is stored in the $JOB special variable. The status of the job (including whether or not it was started by a JOB command) is stored in the $ZJOB special variable. Processes created by the JOB command run as the Caché service account user. This means that you must insure that the Caché service account has explicit permissions to access all necessary resources. On Windows platforms, the job process uses the userid established for the Caché instance. Caché assumes that the invoked routine includes code (that is, OPEN and USE commands) to handle device ownership for the new process. The default device is the null device. Caché does not assign a default device to any process other than the process started at sign in. Caché also allows you to establish default priorities for jobbed processes. You can use the SetBatch() method to establish a process as executing in batch mode. A batch mode process has a lower priority than a non-batch process. Issue the JOB command while in another namespace, and specify the raw partition as the nspace process parameter of the JOB command. Here nspace is an implied namespace. An implied namespace is a directory path preceded by two caret characters: "^^dir". Implied namespace syntax is described in Global Structure in Using Caché Globals. On the receiving system, go to the Management Portal, select System Administration, Configuration, Additional Settings, Advanced Memory. Locate netjob to view and edit. When true, incoming remote job requests via ECP will be honored on this server. The default is true. The license on the remote system must support enough users to run remotely initiated jobs. You can determine the number of available Caché licenses using class methods of the %SYSTEM.License class, as described in the InterSystems Class Reference. The action Caché takes depends on the job location syntax you are using. ["namespace"] Caché checks whether this explicit namespace has its default dataset on the local system or on a remote system. If the default dataset is on the local system, the system starts the job using the parameters you specify. If the default dataset is on a remote system, the system starts the remote job in the directory of the namespace’s default dataset. ["dir","sys"] Caché converts this location to the implied namespace form ["^sys^dir"]. ["^sys^dir"] The job runs in the specified directory on the specified remote system. Caché does not allow any routine parameters, process parameters, or timeout specification. ["dir",""] Caché issues a <COMMAND> error. Caché does not provide global mapping for remote jobs, whether or not global mapping has been defined on the requesting system. To avoid the lack of global mapping, use extended references with your global specifications that point to the location of any globals not in that namespace. If the namespace you specify in an extended reference is not defined on the system you specify, you receive a <NAMESPACE> error. Namespaces and the syntax for extended global references are described in Global Structure in Using Globals. JOB Servers are Caché processes that wait to process job requests. Jobbed processes that attach to JOB Servers avoid the added overhead of having to create a new process. Whenever a user issues a JOB command with the switch parameter set to use JOB Server if available, Caché checks to see if any JOB Servers are available to handle it. If not, it will create a process. If there is a free JOB Server, the job attaches to that JOB Server. There are some unavoidable differences between the JOB Server environment and the jobbed process environment, which may be a security concern with jobbed processes executing in JOB Servers. A jobbed process takes on the security attributes of the process that issued the JOB command at the Caché level. If your job does not start, check your I/O specification. Your job will not start if Caché cannot open the devices you requested. Note that the null device (/dev/null on UNIX®) is always available. If your job starts but then halts immediately, make sure you have sufficient swap space. Your job receives an error if you do not have enough swap space. Make sure you are not exceeding the number of processes for which you are licensed in Caché. You can determine the number of available Caché licenses using class methods of the %SYSTEM.License class, as described in the InterSystems Class Reference. 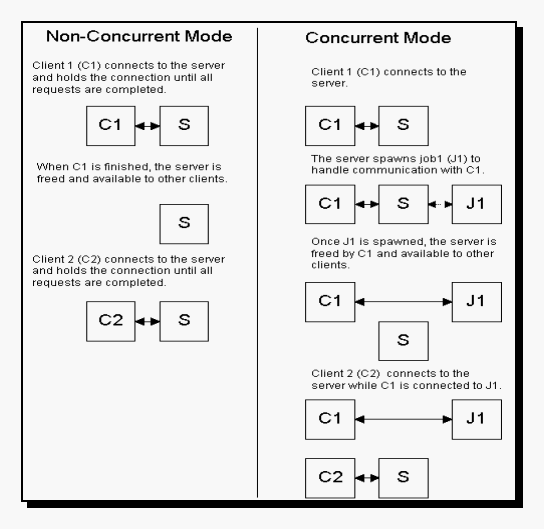 The spawned process starts at the designated entry point using the specified device(s) as TCP device, principalinput, and principaloutput device. The TCP device has the same name in the child process as in the parent process. The TCP device has one attached socket. The USE command is used to establish the TCP device in M mode, which is equivalent to PSTE. The P (pad) option is needed to pad output with record terminator characters. When this mode is set, WRITE ! sends LF (line feed) and WRITE # sends FF (form feed), in addition to flushing the write buffer. The child uses the inherited TCP connection to pass its job ID (in this case assumed to be 3 characters) back to the client, after which the child process exits. The client opens up a connection with the server and reads the child’s job ID on the open connection. In this example, the IPv4 value "127.0.0.1" for the variable "host" indicates a loopback connection to the local host machine (the corresponding IPv6 loopback value is "0:0:0:0:0:0:0:1" or "::1"). You can set up a client on a different machine from the server if "host" is set to the server’s IP address or name. Further details on IPv4 and IPv6 formats can be found in the section Use of IPv6 Addressing in the chapter Server Configuration Options in the Caché Programming Orientation Guide.